When you walk up to the MRX, you’ll be awed by the beautiful lines. Climbing aboard you’ll appreciate the comfortable seat and riding position, and the high-tech rider communications pod, with the large, backlit tachometer, the cool light tracers that follow the tach needle, the digital speedometer, multiple temperature gages for coolant and oil, and the fuel level gage. Built in lap, zero to 60, zero to 100, and 1/4 mile timers make this a fun track bike, too. The engine fires to life willingly, and within a minute it’s choke ’off’ and ready to roll. As you pull away you’ll notice just how easy it is to ride a torquey V-twin around town- the MRX pulls from anywhere in the rev range. The confidence-inspiring light weight and low chassis make for a fun ride. From 3,000 to 10,000 RPM, the MRX has power on demand. In the curves the MRX shines again. The mass is set so low and centralized that it seems as though the bike can read your mind- it turns in that willingly. And when leaned over it is just plain stable; the multi-adjustable inverted forks and Öhlins rear shock soaking up any bumps. The MRX has zero tendency to stand up under braking when leaned over, inspiring greater confidence than any bike you’ve ridden- it’s really that good. The chassis was derived from the Harley Davidson VR1000 Superbike. As developed by Championship-winning road racers Miguel Duhamel, Scott Russell, and Doug Chandler, the VR1000 Superbike was considered perhaps the best chassis package in all of motorcycle racing, derived as it was from the GP bikes of the era. You can feel that legacy on the MRX. While the rear shock is a well-sorted Öhlins unit and the compliant inverted front forks with compression and rebound adjustments really let you enjoy the GP-like chassis geometry. The MRX is solidly built, light weight, with a great chassis and suspension, and a smooth, powerful motor, all in a beautiful, exotic package at a great price. That’s the MRX- The American Exotic. For any Western boutique bike brand, going head-to-head with the Japanese invariably has meant taking the high road in specification, styling, performance and, especially, price. But you'd better have courage and cojones in equal measure to take on Asian manufacturers on their own turf, with well-priced products aimed at the volume end of the market, where margins are minimized, risks multiplied and economy of scale rules. 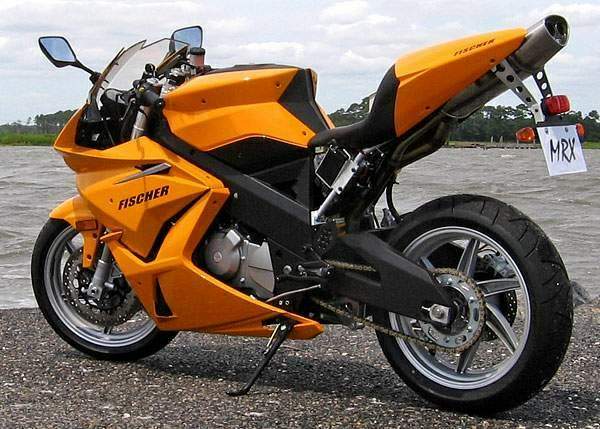 Yet that's exactly what fledgling American manufacturer Dan Fischer has done in creating the MRX sportbike bearing his name, which has commenced small-scale production (20 bikes in the last few months of 2006 for customers who've already paid deposits) in the Fischer Motor Company's Maryland factory. Providing entry-level excellence for $7999--ordered directly online from Fischer while a dealer network is created--with a product that looks as if it costs more than twice that amount is his bold roll of the dice at a table containing plenty of established players. But the MRX is a lot of bike for the buck, with a clever blend of dedicated, intelligently spec'ed components matched to Korean-sourced parts that do their job perfectly well, while allowing Fischer to hold the price down to that sub-$8K figure. Dan Fischer"I was looking to provide a domestically produced entry-level sportbike consistent with the product American consumers were buy-ing almost solely from Japanese suppliers," says the 42-year-old former Superbike racer, "but with more dramatic styling appeal and improved chassis performance." Still, Dan's gambit might not be the high-risk venture it seems to be. First off, the MRX's leading-edge looks come courtesy of one of the world's most prominent freelance bike designers, Glynn Kerr. Second, its aluminum twin-spar frame is the product of Gemini Technologies, creators of one of the sweetest-handling Superbikes of the 1990s, Harley's VR1000. 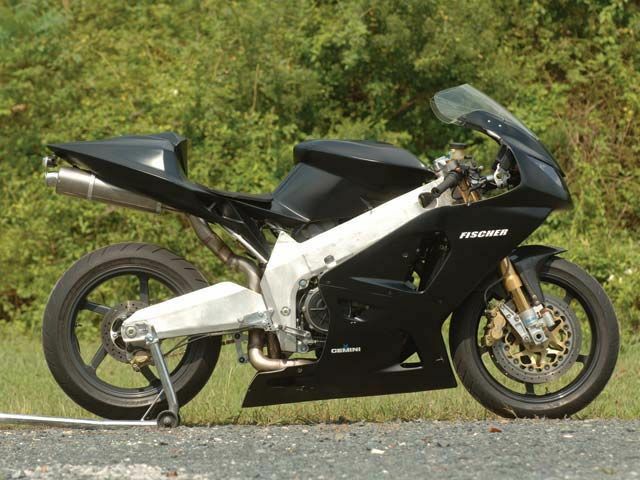 Third, said frames come equipped with an equally trick-looking and oh-so-sturdy swingarm, operating an hlins shock via a rising-rate linkage--not exactly entry-level componentry. Last is the engine, the most difficult, complex and expensive element of any such enterprise. The MRX's is a modern liquid-cooled 647cc 90-degree V-twin, oversquare with 81.6 x 62.0mm bore and stroke dimensions, plus double overhead cams and four valves per cylinder, sourced from Korean manufacturer Hyosung for its GT650R and Comet models. 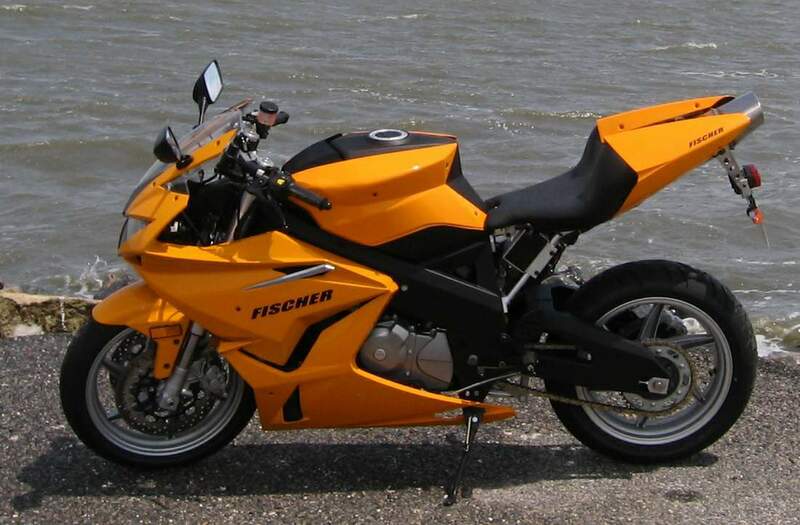 Fischer claims 79 bhp at 9000 rpm and 50 lb.-ft. of torque at 7200 rpm for the engine in the bike I rode, fitted with 39mm Mikuni carbs (soon to be replaced with fuel injection) and a U.K.-made Micron exhaust. Those figures seem more than a match for the 72 bhp at 9000 rpm and 47 lb.-ft. at 7200 rpm Suzuki claims for its SV650S, natural competitor to the MRX. Designer Glynn Kerr's drawing for the original Fischer MR 1000. Rotax was to supply the same 998cc 60-degree V-twin Aprilia used. 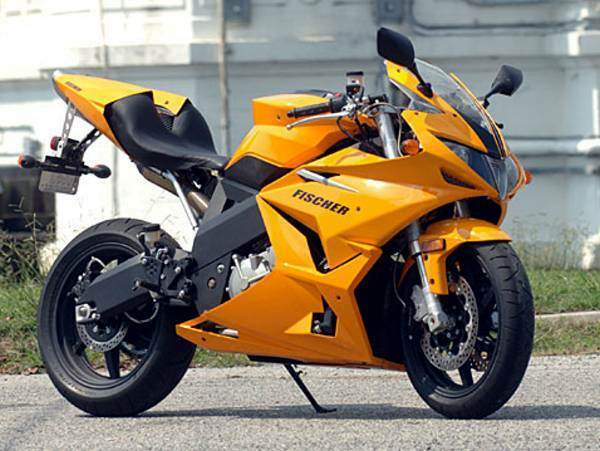 When Rotax couldn't deliver, Kerr and Fischer had to start from scratch--again.Fischer plans to manufacture 700 bikes in 2007, ramping up to 2500 annually by 2010, and eventually build 5000 a year. The bike I rode for a day around southeast Maryland's Chesapeake Bay was built almost entirely with production-ready parts, save for its tubular rear subframe. That will be replaced by a cast-aluminum structure that will also have provisions to carry an optional passenger seat and footpegs. There might be detail changes aimed at refining the MRX and streamlining its manufacturing, but essentially the production bikes' makeup will be the same as this. Taller riders will have a slightly easier time slinging a leg over the MRX, not because of the bike's average, 31.5-inch seat height, but because of the height of the shroud for the Micron can, which passes through the subframe and underneath the passenger seat. 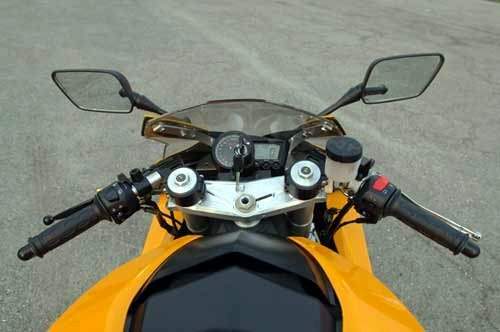 Once settled in, riders will notice the riding position feels just slightly to the sporty side of standard, thanks in part to the humanely low footpegs and to flattish clip-ons mounted above the top triple clamp rather than below. Overall it's a relatively upright real-world riding stance that's comfortable and rational for street use, nicely matched to--by sportbike standards, anyway--a well-shaped and padded seat that's plenty plush and definitely accommodating for a 6-foot rider; a rarity among sportbikes. What's more, the Asdo dash allows you to choose any of a half-dozen background colors to illuminate the digital speedo and analog tach. Just press a button and scroll through till you find one that matches your mood. Kerr was disappointed with his clay mock-up of the MR 1000, so he actually welcomed having to redesign the entire motorcycle, a decision forced by the Hyosung V-twin's smaller displacement and wider Vee angle.The MRX's clip-ons can claim their territory above the triple clamp because the Daesung inverted fork from Hyosung's GT650R has been pulled up through both triple clamps. Doing so reduces front ride-height without forfeiting cornering clearance, at least on the right side. (The sidestand, on the left, needs a redesign because it drags all too easily and can lever the rear tire off the ground in turns.) This tactic also enhances front-end weight bias to offer superior grip for the Bridgestone front tire. The Fischer's steering needs longer stops, however, because at full-right it's too easy to trap your thumb against the fuel tank. Instead, use that thumb to depress the starter button, and the MRX's Hyosung V-twin fires up instantly and almost silently, immediately settling into a high, 1800-rpm idle; probably chosen in the absence of a slipper clutch, to counter typical V-twin reverse-torque inertia and subsequent rear-wheel hop when downshifting for turns. The Micron pipe delivers a muscular, booming lilt to an engine note that sounds more soulful and stirring than any of Hyosung's donor models. While acceleration is brisk rather than awesome (just as it is with the GT650R and SV650S), there's stirring performance from this gem of an engine, whose key asset is its flexible, forgiving nature. Together with the light, progressive clutch, the MRX is a delight in town or traffic, thanks also to the relatively upright riding stance. Though neutral is sometimes difficult to find, the six-speed transmission fully matches Japanese standards, with a light, precise shift action and well-chosen ratios. The top two gears are both overdrives, giving the MRX a long-legged feel. Hyosung started work on a family of V-twins including this 647cc 90-degree example--in 1998. By 2002 the company was busily developing a 1000cc version as well.The engine's slightly laid-back feel extends to the chassis as well. Even with a 0.2-inch-shorter wheelbase than the GT650R carrying the same engine, the Fischer isn't particularly fast steering, but it's adequately agile thanks to extra leverage from its flat clip-ons. The MRX also serves up a well-mannered ride, the fully adjustable fork (nicely dialed by Dan Fischer, the principal test rider) shrugging off surface irregularities even while cranked over. It offers good compliance, and though quite softly sprung, doesn't dive excessively under braking, and there's no trace of chatter from the front Bridgestone when you crank the MRX hard around a 90-mph top-gear sweeper, even if you hit a bump while leaned over. No steering damper is fitted, and none is needed. Perhaps the biggest surprise among the carryover Korean kit are the MRX's brakes, which worked much better in the dry than on any Hyosung. Fischer addressed Hyosung's typical shortcomings of poor response and high lever-effort by fitting four-piston Tokico calipers up front, operated by a Brembo master cylinder and dedicated pads. These grip twin 300mm stainless-steel discs hard enough to deliver excellent stopping power with a fair bit of sensitivity. I'll suspend judgment wet-weather braking until I ride the MRX in something other than Maryland's Indian summer. My experience with the Korean front brakes fitted to the Hyosung Comet was less than satisfactory. They take ages to work in spite of being drilled to drain water from the swept surface. Fischer says this isn't a problem on the MRX, so let's believe him for now--and keep our fingers crossed. If, however, you want truly world-class braking for your MRX, rest assured you can get it. Brakes are just one area prospective owners can upgrade their bikes even before talking delivery. The Fischer MRX is a bike you can have tailored to suit your desires during manufacturing, or upgrade yourself later on as cash flow and inclination allow. By dipping into the options catalog (see it at www.fischer1.com), customers can choose from a huge range of extras, from Brembo four-piston calipers and larger-diameter rotors to full hlins or WP suspension, lightweight Marchesini wheels, carbon-fiber bodywork and more. Fischer says simply swapping the Korean-forkmade and wheels for European units on the options list slashes 44 pounds off the base model's 399-pound dry weight. That's a serious diet, even if it'll cost equally serious money to visit the fat farm. Eventually, Fischer will also offer performance upgrades, including a displacement increase and even a supercharger. Whether it's the base model or one with every option box ticked, Fischer's MRX offers a range of possibilities most other motorcycles can't hope to equal. It's a highly satisfying starter sportbike, a rational and rewarding real-world ride that offers plenty of allure for experienced riders or born-again bikers coming back to the fold. It's also a hand-built sportbike with middleweight performance, but the visual appeal of a costlier superbike and a long list of upgrade options. 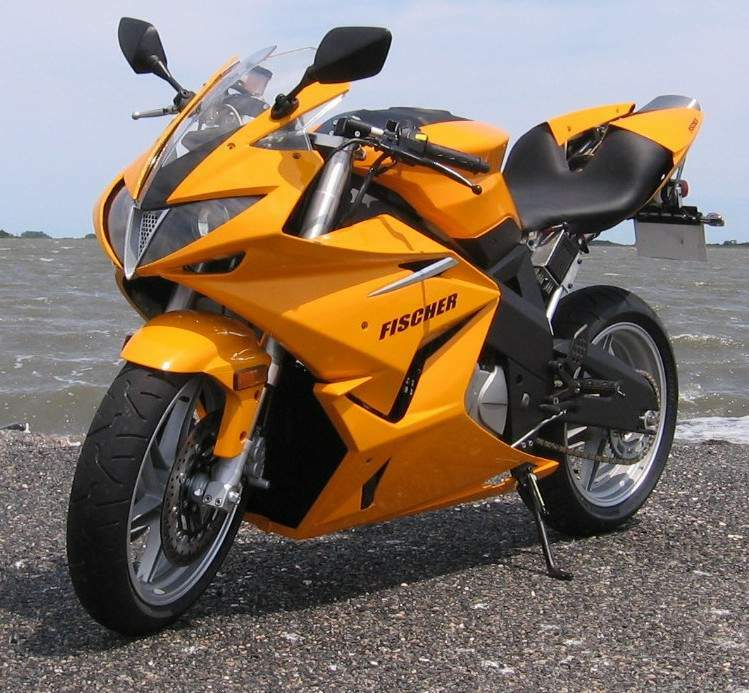 "We have very dedicated sportbike customers in the USA," says Fischer, "but even though Americans are a pretty patriotic bunch when it comes to buying a product, there really isn't an affordable and mainstream U.S.-built sportbike they can purchase. "Our objective is to give them that choice with the MRX, with a rider-friendly powerband from an engine with reserves of performance that'll respond to aftermarket tuning. Match that to a leading-edge chassis derived from the racetrack, with hlins suspension and competitive weight, and you have the picture of what we're offering. We hope we've hit the target!"